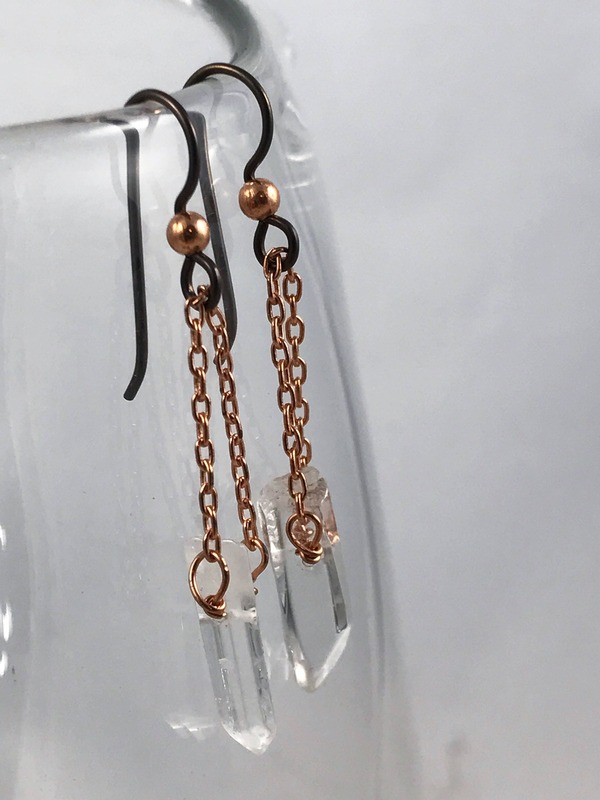 These pretty little polished quartz crystal point earrings make an earthy and elegant statement. Mounted on pure solid copper, they catch light and move beautifully. Dangling from hypoallergenic Niobium hooks. 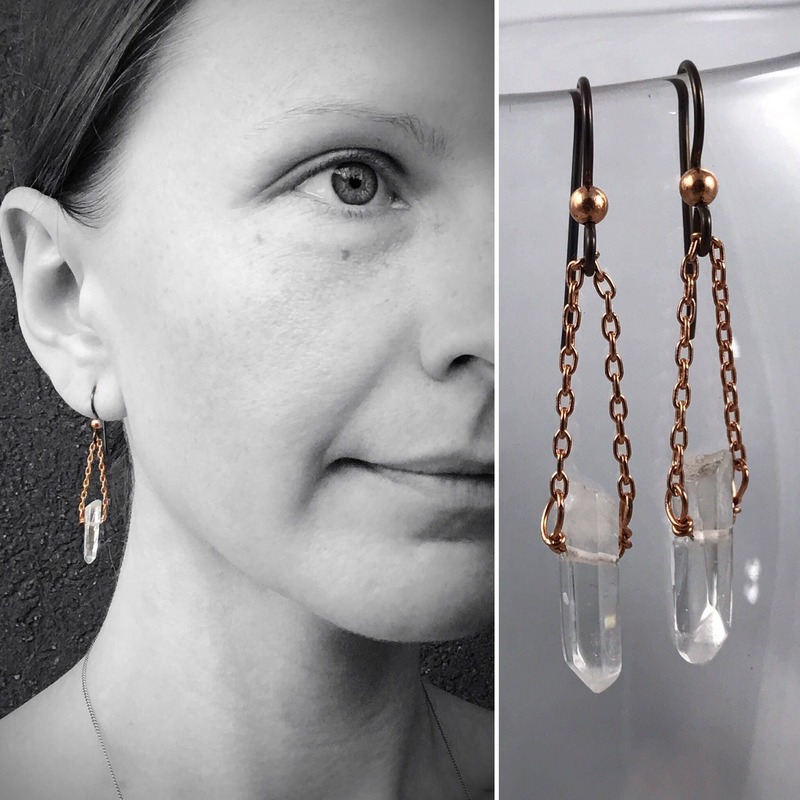 These earrings are made to order, the pair in the photos is sold and yours will be created just for you with it's own polished quartz crystal points. 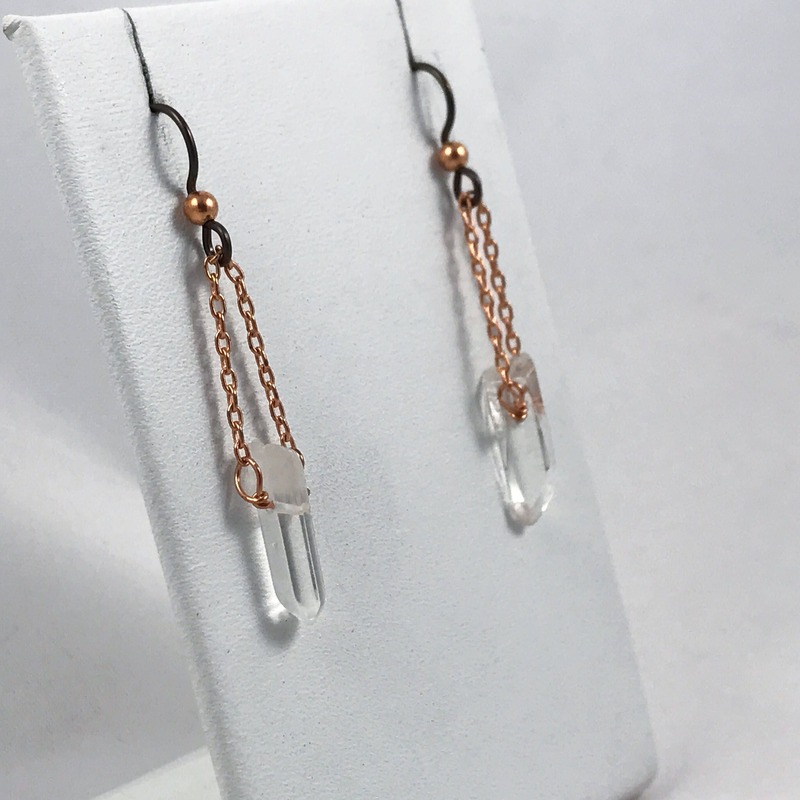 -Earrings feature genuine polished drilled quartz crystal points. 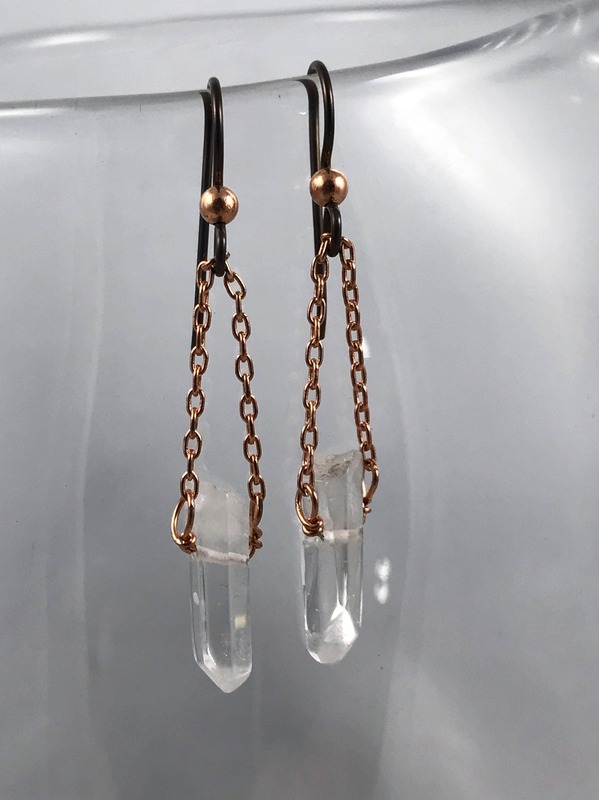 -Points are mounted on pure raw solid copper wire, and dangle from pure raw solid copper chain. -Earring hooks are hypoallergenic Niobium with a copper accent bead (see below for info about Niobium). -Total length of earrings from the top of the earring hook to the bottom of the point is 47mm (1 5/8"). - Earring drop length from connecting point at bottom of earring hooks to bottom of design is 32mm (1 1/4"). -Crystals measure 16mm (5/8") long by 5mm (3/16") width. Quartz crystal is a silicon dioxide mineral, and is one of the most well known, abundant and varied minerals on earth, occurring in many different forms and colors and found in almost all mineral environments. It has been known, utilized and appreciated since the stone age. Even in modern times, it is one of the most useful and utilized minerals for many applications. One of the most amazing properties of quartz is the ability of its crystals to vibrate at a precise frequencies. 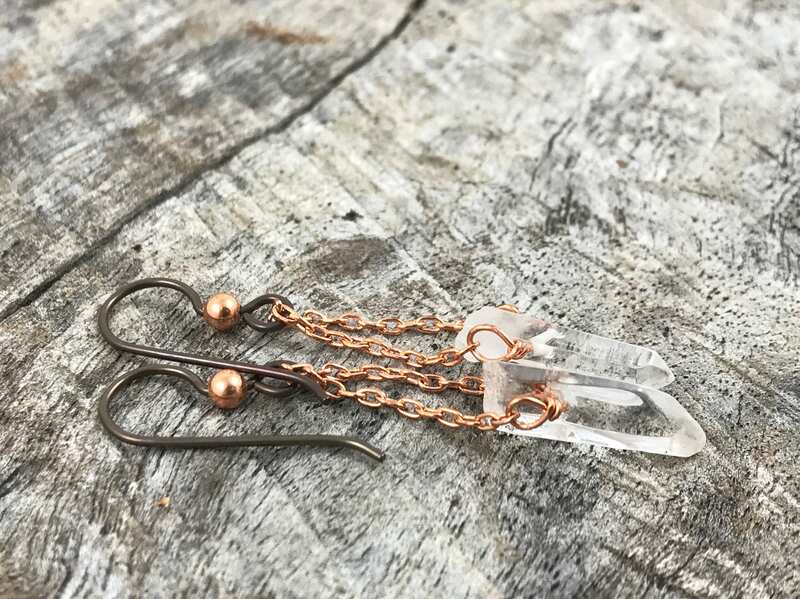 These frequencies are so precise that quartz crystals can be used to make extremely accurate time-keeping instruments and equipment that can transmit radio and television signals with precise and stable frequencies. Highly valued by spiritual leaders and healers as well as scientists, quartz is a high vibration crystal, sometimes called the "Stone of Ultimate Power" and the "Supreme Gift of Mother Earth" It is said to embody the purest vibrational energy, allowing for clearing and cleansing, healing and balancing, protecting and harmonizing of mind, body, and spirit. It is also said to amplify the energy of any stone around it, making it a powerful companion to other healing stones.